Global technology innovator LG Electronics Philippines (LGEPH) and ELS Philippines, Inc. (ELSPI), in partnership with Breakfast Ride (BR) and One Ride One Mission (OROM), are set to improve the lives of Person with Disability (PWD) Filipinos starting with the beneficiaries of the House with No Steps Foundation (HWNSF). The partnership took place due to the strong ties among the four parties. 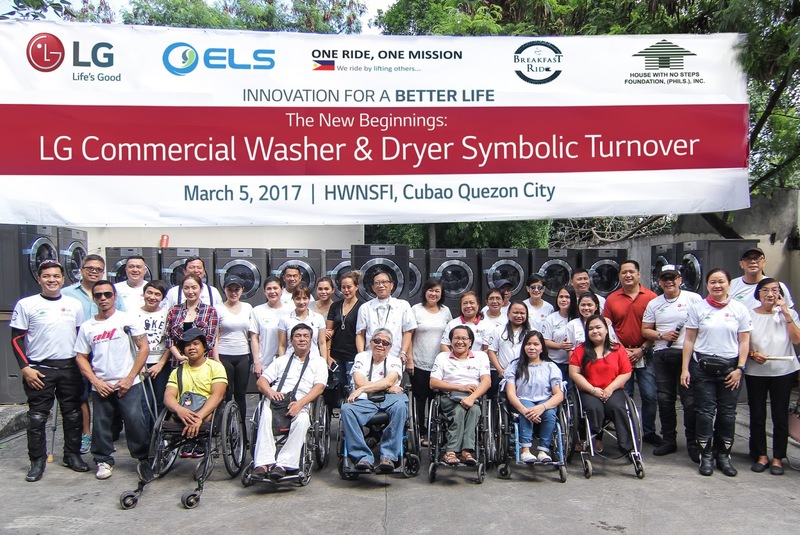 As one of the authorized partners of LG commercial washers and dryers, ELSPI is headed by their Managing Director, Joey Ermita, who is also a member of BR/OROM, a group which creates programs that promote motorcycle safety and unite all riders in a common advocacy “to ride by lifting others”. BR/OROM was founded by Raymon Gabriel, whose father-in-law is a PWD and the founder of HWNSF. With all these groups linked together, LGEPH, ELSPI and BR/OROM converged to create an innovative CSR program for the PWD members of the HWNSF. The concept is to renovate one of the HWNSF buildings in Cubao, Quezon City and turn it into a facility for a commercial laundry livelihood shop. This aims to establish a sustainable program that will be managed by HWNSF and operated by their PWD members, who will now be given an active role in our society given this livelihood opportunity. The project was recently launched through a ceremonial turnover of LG commercial washers and dryers at the site. The meaningful event was graced by representatives from PWD (including the musically-talented Rondalla on Wheels), HWNSF, LGEPH, ELSPI and BR/OROM, as well as Koronadal Mayor Peter Miguel, who is also the president of National Federation of Motorcycle Clubs Philippines. While LG’s main contribution comprises 15 commercial washers and 15 commercial dryers, ELSPI and BR/OROM will ask for donations and support from motorcycle clubs and riders as well as various organizations for specific logistical requirements for the completion of the project.